This vehicle is part of the Le Tall collection left to the Society by its founder, Vincent Le Tall. The registered keeper in the RF60 registration book (buff log book) is a Miss Jessie Plumb of 301 Burton Road, Lincoln. Miss Plumb did not drive so the '10' was driven by a Miss Elsie Harrison, a music teacher who lived with Miss Plumb. Vincent Le Tall acquired the car on 27 April 1971 and it was garaged with his other 'Austin' cars - four of which are now owned by the Society. This 10 compares differently to VL 8960, the Austin 10 Cambridge in the Society collection, having a different engine and combined body / chassis, etc. When time permits work will be carried out on the doors, window seal rubbers and underside paintwork. April 2005 - The engine is now running after a very long lay up. Some of the wiring has been replaced, headlamps converted to double-dip and an isolator switch fitted to the main battery lead. The nearside king pin and bushes have yet to be replaced when time allows. July 2005 - This is the latest Society owned car to take to the road. October 2005 - The '10' has had the front Girling brake boots replaced - these were obtained from the Austin 10 Drivers Club spares stand at Longbridge in July. The flexible oil pipe feeding the oil pressure gauge has also been replaced as the original was looking rather suspect. The pipe was made to a pattern by a local hydraulic pipe manufacturer for a very reasonable price. July 2007 - The 10 attended The Austin Ten Drivers Club Lincolnshire Austins in Action Day on the 22 April. This was in the form of a road run from The George at Leadenham via country lanes to Woodland Waters at Ancaster, with a good turn out of Austins from 10s to 16s. The 10 has also been over the pit for a clean up and grease on the underside, ready for its M.O.T. Oct 2007 - This was on show together with the 1936 Austin 18 York at Wragby Show, just north of Lincoln, on the 2nd September. This show also has a good display of cars, motorcycles and tractors. July 2010 - The Ten has also passed its MOT. A new top water hose has been fitted together with a new heater hose adaptor connector. 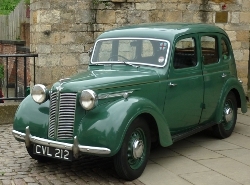 January 2011 - The Austin has had two new tyres and inner tubes fitted. July 2011 - The '10' has had all the steering and chassis points greased plus some of the chassis cleaned and painted. October 2014 - The 10 passed MOT in time for the car running day in August. New tyres are on order. July 2015 - The 'green 10' needs a set of tyres due to cracking of its existing set. Avon 500/525 x 16 tyres are available at a cost of £ 130 each. The 10's existing tyres will go on to the Vauxhall to make that long term project at least mobile around the Museum site.